Description: BNSF Southbound Freight Train at Ardath, Mo. Description: Todays L631 had one of the two former LNG units leading, Shown here passing through Jasper and over the Norfolk Southern dimond. Description: NS Eastbound Vehicle Train 270 rumbles through Woodlawn, Al. Description: This ex-LNG powered SD40-2 was on the Q-ENISTL1 09. Title: BNSF 7890 Q380 7:55 A.M. Description: BNSF 7890 the X-BN Natural Gas Locomotive leads a stack train out of La Crosse. 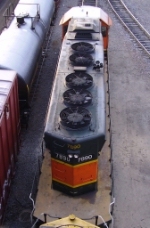 Description: One of maybe 3 or so SD40-2s with flared radiators sits idling on a balmy day. Description: A very rare type of SD40-2 sits in the storage lines at Northtowns T yard. I believe this unit involved in a wreck and got SD45 flares, or was one a a few SD40-2s that were tested to run on natural gas. Description: Stored SD40-2s at Northtown. Note the flared hood on 7890. Description: Note the flared long hood. This was once a unit fueled by LNG.